How Did MNPS High Schools And Subgroups Do On The ACT? I recently wrote about the release of ACT scores for the state and specifically for Nashville. We learned that only 11% of MNPS students were college and career ready according to the ACT. Today, MNPS released more in depth information on the individual high schools as well as information on specific subgroups in Nashville. According to MNPS, 4,376 seniors took the ACT with the average score of 18.2. Seniors need to have a composite score of 21 or above to qualify for the HOPE scholarship. While the percent of high school students qualifying for HOPE scholarship decreased, the number of students qualifying for the scholarship actually increased from from 1,131 to 1,219 students. Before we look at the scores of individual high schools, I want to look at the ACT scores based on subgroups. Below we see the gap between Black (16.7), Hispanic/Latino (16.9), and White (20.7) students. That’s a 4 point different between Black and White students and a 3.8 point difference Hispanic/Latino and White students. How did individual high schools do? The top traditional high schools for ACT achievement are Hume-Fogg (26.8), MLK (26.3), and Nashville School of the Arts (20.5). The lowest traditional high schools are Pearl Cohn (14.5), Whites Creek (15.7), and Maplewood (15.7). Obviously, the top three schools are all magnet schools. Stratford tested many more students in 2016 and had an increase of 0.5 points. 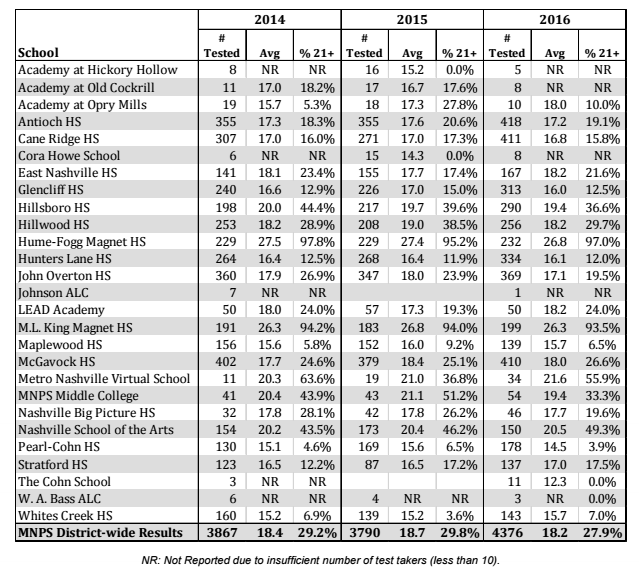 East Nashville, Whites Creek and Metro Nashville Virtual School saw test score increases while having modest increases in the number of test takers. LEAD Academy tested slightly fewer students but saw an increase in scores. MNPS is working with Alignment Nashville to give free ACT preparation classes to students who cannot afford them. Last year, Alignment Nashville worked with Hunters Lane, Hillsboro, Maplewood, and Overton. Additional schools may be added this year. I am so glad that Alignment Nashville is partnering with our schools to prepare our students for the ACT. We are doing a disservice to our students who graduate from high school not prepared for college or career. It breaks my heart that thousands of students are missing out on the HOPE scholarship. More must be done to help these students, and all of that shouldn’t be left to our high school teachers. Preparing our students for graduation starts before the students even get to the high school level. MNPS transformed our high schools years ago towards the academy model. I think it’s time to start looking at the transformation of elementary and middle schools. Elementary and middle schools need more supports in place to help close the gaps before students move on to high school. 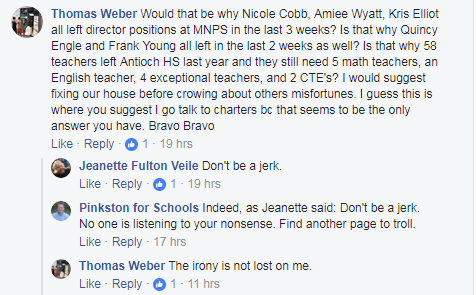 I don’t have all the answers, but I hope MNPS will be looking into ways to give more support to our lower grades.